10 Reasons Why Google Chrome Should Be Your Default Web Browser - OMG! Ubuntu! An official version of Google Chrome has been available to try out for several months. It fully supports flash and extensions, is super fast to both start-up and load pages and is so incredibly stable you will wonder why it’s not already been signed off and labeled “beta” already! Below are 10 reasons why i think it should be your default browser. First things first �” Chrome is super fast. Quick, swift, pronto, whatever! it’s really fast at loading pages. Try two pages side-by-side in Firefox and Chrome and see. A common complaint about Firefox in Ubuntu is the time it takes to start-up/launch/open. It’s not the most instant launching application! This may or may not be a shock to you �” but Google Chrome already has extensions! Tons of them! You can find these and plenty more on awesome Chrome User site chromeplugins.org. A lot of people who use Firefox may have plenty of add-ons �” but many of these addons are not needed in Google Chrome because they’re already built in! A “faviconize tab” feature can be reached by right clicking a tab and choosing ‘pin tab’. This shrinks it down to just it’s favicon and keeps it open. Google Chrome’s “new tab” page is a speed-dial, allowing quick and painless access to your most popular sites. Chrome doesn’t have the traditional layout of a main menu on top �” it tucks all of it’s options away in logical system and preference buttons. Take Your Chrome Bookmarks Everywhere! Google Chrome has built in bookmark syncing �” meaning no more third party applications and extra logins �” just use your Google Account and access all of your bookmarks on any computer using Chrome! You can enable this feature suing the –enable-sync flag. You can use the thousands of userscripts available at userscripts.org with Chrome! and pop your download userscripts in it. Note: You’ll need to add –enable-user-scripts as a flag to your launcher. Google Chrome has been flash-friendly for quite a long time and it is incredibly stable already. It’s also fully HTML5 ready. Google Chrome can use your gtk theme for ultimate desktop integration. Just go to the wrench icon > options > customize > Use GTK / use system borders. It can be a bit hit-and-miss with some GTK themes as it pick up the colour for the border from the "highlight" colour in the GTK theme. Firefox uses your GTK theme also, so this isn’t exclusive to Chrome, but a feature people might not know about nonetheless! 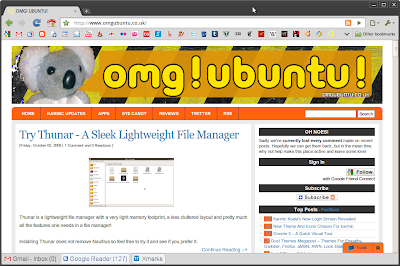 If you don’t like the way your GTK theme looks on Chrome, why not try out a Chrome Theme? You can find plenty of them over @ https://tools.google.com/chrome/intl/en/themes/index.html. Glow goes very well when using the ‘Impression’ theme. Folders is great with light coloured themes. Earthy goes well with most dark themes �” particularly shiki-dust and Karmic’s Human theme. Google Chrome also offers the ability to create application shortcuts to your favourite online applications – such as Google Docs, Avairy Suite, GTalk, etc. You simply go to your favourite web app, hit the Control menu in Chrome and choose ‘Create Application Shortcut’. They run in their own separate windows and is a great way to get Google Tasks on your desktop amongst others! 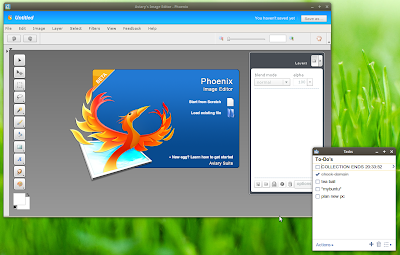 Avairy Pheonix Image Editor & Google Tasks running as desktop web apps. 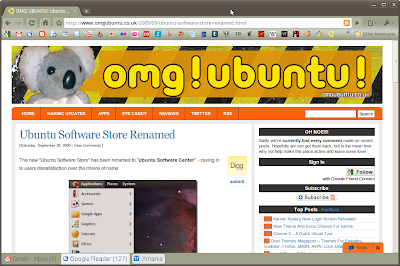 Whilst this functionality can be acheived in Firefox it doesn’t require an addon or external package in Chrome.